With increasing frequency, humans have transported species around the globe, leading to geographic homogenization of formerly distinct communities. This loss of uniqueness among communities, and its consequences, have become major concerns for conservation biologists (Soule 1990). Competition and predation from alien species, as well as the spread of introduced diseases are well-recognized factors contributing the decline and disappearance of unique native species. More recently, genetic homogenization has been recognized as an additional consequence of alien species introductions. Genetic homogenization, at a global scale, results from hybridization between native and introduced species or populations. 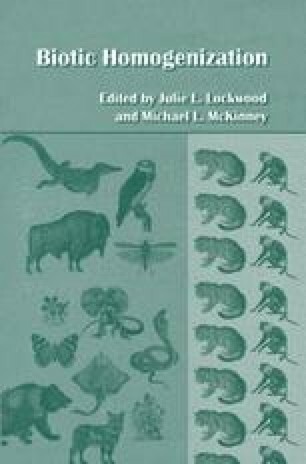 Rhymer and Simberloff (1996) reviewed cases of hybridization between native and alien species and populations, emphasizing examples and consequences in a wide variety of animal taxa. This chapter focuses on hybridization between native and alien plant species and its implications for plant conservation. We consider a species alien when it is known to have been introduced to a given region from a different region of the world.